Weddings are special occasions when limousines and party buses are required the most. In general, luxury vehicles for wedding limousine services are reserved in advanced. This is mainly due to the high demand associated with these popular rides. Here are some common questions and tips on how to reserve the right party bus or limo for the bride and groom as well as the wedding party. Why should I get a limo or party bus for my wedding? Limousines and party buses present the best means of transportation for your entire wedding party. Shuffling people around from location to location in multiple vehicles is a nightmare that is often overlooked by the bride and groom. Booking a limousine or party bus for a wedding will allow everyone to travel together for pictures and partying! What kinds of limousines do you have? We have access to the largest fleet of limousines and party buses in Florida! With over 100 different options, you are certain to find the vehicle that is perfect for your special wedding day. We have limousines that seat up to 20 passengers and party buses that seat up to 50! Our fleet includes some of the hottest makes and models on the market including, Cadillac Escalades, Hummers, Lincoln Navigators, Infinities, Town Cars, Chrysler 300s and many more! What is included in the wedding limousine services? Each limo or party bus will have its own unique look and feel. Most of our rides will have flat screen TVs, DVD/CD players, laser lights, wet bars, and leather seating. Some limos and party buses come with high end audio equipment that will make you feel like your riding in a club on wheels! Our drivers provide water, soda, and ice on every trip. How to make multiple reservations? Our agency not only arranges premier limo transportation for the bride and groom, we also arrange luxury rides for your wedding guests. It would be beneficial to choose a renowned company like ours for providing these services. Our company offers limos as well as party buses to fulfill all of your wedding needs making it convenient to book multiple vehicles from us. 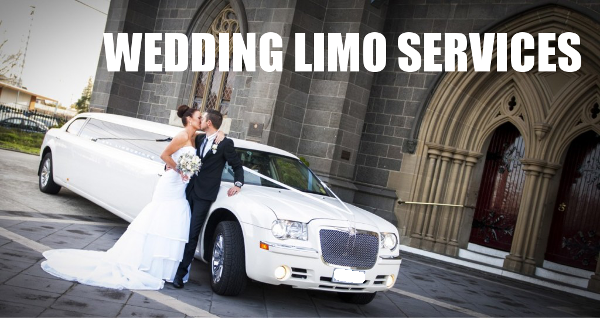 Do you have any wedding limo package deals? All of our pricing varies from vehicle to vehicle, depending on how long you will need the ride, as well as how many people will be traveling with you. Wedding Limo Package pricing often includes a minimum of a 3 hour rental, with a free hour if you book for longer than 5 hours.